Herbs are a great way to flavor almost any food dish, but buying them at the store can be expensive. A more cost effective option that adds money to your pocket and flavor to your meals is to grow and dry your own herbs. It can also be tons of fun, especially if you have children who can help. Fresh herbs have a benefit over the dried ones you buy in the store. 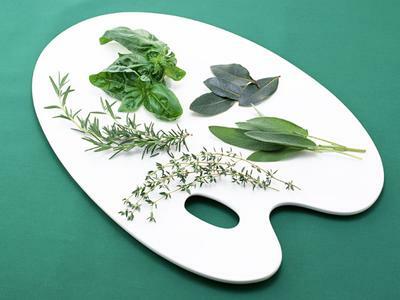 If you have a sunny spot and some good soil, you can grow your own herbs at home. Choose the ones that you use most to season food and grow them in small planters. When growing herbs, treat them like any other plant. Pruning and cutting back the leaves brings even more leaves. As you cut and use fresh basil, oregano, rosemary, and thyme, they will continue to grow. In fact, the herbs may grow faster than you can use them, so share some with friends and neighbors. Another alternative to letting the extra go to waste is to dry your fresh herbs. Dried fresh herbs lose their moisture, but still retain the entire flavor of a fresh plant. You’ll now have herbs to last for months to come and you can pass them on to others once they are dried as well. Begin with your equipment. You’ll need a place to dry them. You can use wooden or wire racks. That cooling rack you use in the kitchen for cookies and cakes would be perfect for drying herbs. Gather together a colander, some cheesecloth, paper towels, and some string. All herbs to be dried should be washed and rinsed in cold water. A colander is perfect because the water can drain out the bottom. Use paper towels to pat each leaf and stalk until dry of any visible moisture. Herbs can be dried in many ways. If you only want the leaves, remove the stalk and lay the leaves on a drying rack. Depending on the size of the leaves, you may need a wire rack for them as opposed to a cooling rack from the kitchen. Herbs can also be dried in bunches. Tie them with string at the stalks and hang them upside down on a nail to air dry. This can be accomplished outside or indoors, but should be done in an area that is ventilated with no humidity. Humidity will help your herbs to retain their moisture and prevent drying. Use cheesecloth to cover herbs on a cooling rack if you plan on letting them dry outside. Use the oven for faster drying. The temperature should remain low (around 120 degrees). Gently touch the leaves every half hour to test for dryness. The microwave oven is an alternative, but you will have to be careful not to shrivel them up. Dried herbs will keep for a six months. After that, the flavor begins to wane. Herbs should be stored in Mason jars or plastic containers, just be sure to label them so you know which herb is which. In order to keep the herbs dry and avoid molding during storage, seal the containers air tight. Herbs season food in many unique and yummy ways. Drying herbs allows you to savor the flavor while saving money and having fun all at once. Don’t waste precious time searching the internet every time you need some inspiration! Instead download your own lifetime Cookbook Library of 32 cooking books covering every food you could ever want to prepare!